What to wear when snorkeling + What NOT to wear :: hawaii. caribbean cruise. florida keys. Snorkeling can be a pretty minimalist activity, similar to what to wear when hiking. As long as you’ve got your mask and snorkel, you are good to go! With hiking, it’s a good pair of footwear like these hiking sandals that you’ll want at the least. With snorkeling, it’s a comfortable mask and snorkel that you’ll want at the least. After that, generally speaking, you can have fun with snorkeling (and hiking) with clothes you already have. In terms of the norm, it would be perfectly acceptable to wear your regular swimsuit when you go snorkeling. And it’s also acceptable (and normal, especially for kids who are snorkeling) to wear more than just a regular swimsuit. With both snorkeling and hiking, for even more comfort, and sometimes for even more safety, there’s more that you can think about for that improved comfort and safety. In the case of snorkeling, that’s comfort and safety from the sun. Because who wants to deal with the pain of sunburn when on vacation! Here are some snorkeling tips! What’s something you DON’T want to wear when snorkeling? You may want to think twice about wearing the popular sunscreen brands when you go snorkeling. There are products with certain ingredients in them (or rather, without certain ingredients) that are considered to be the best sunscreen for snorkeling. The biggest issue is that there are concerns that most sunscreen products are made with harmful chemicals. And that includes popular sunscreen brands like Sun Bum and Neutrogena, although both of these brands also do have less toxic sunscreen too. And the concern is that these chemicals are killing the coral reef. Why should you care about coral reef? Even if you’re not an environmentalist, here’s why you should care as a snorkeling enthusiast. Why do you go snorkeling? So that you can see the colorful tropical fish. Well, if there’s no reef then there will be no fish. So to keep the fish around, you want to keep the reef around! So basically, if you want to keep snorkeling with the colorful fish (and want to help others do the same in future years to come) then it’s best that you be a “responsible tourist”! But even this brand has some sunscreen that is NOT safe for coral reef. So be sure to check that you buy the Sun Bum that’s reef-safe sunscreen. They have a whole bunch of other sunscreen products too, like a face stick, flavored lip balm, mineral-based pocket size sunscreen (i.e. travel-friendly aka carry-on friendly! ), sunscreen in a small jar. When looking for sunscreen, look to see if it has the ingredient OXYBENZONE. This is the chemical that a lot of sunscreen products are made with that is said to be harmful to marine life. You can also look for sunscreen that’s deemed to be reef-safe sunscreen. Much of the time the alternative ingredient that’s safe for coral reef is zinc oxide. How big of a deal is this oxybenzone stuff? So big of a deal, that there’s a Hawaii sunscreen ban and a Key West sunscreen ban. These places are going to make it ILLEGAL for any sunscreen containing oxybenzone to be sold. This law is set to get into effect in 2021 in both Hawaii and the Florida Keys. And if saving the reef isn’t enough to motivate you to use this sunscreen, the products listed above are enriched with antioxidants and vitamin E.
First, here’s the quick list of what to wear when snorkeling that could be the best snorkel gear for you to think about! This type of phone case so you can take pristine underwater pictures with your phone – it’s cheap! So, is wearing a swimsuit the best to wear when snorkeling? If what you typically wear to the beach or pool is not form-fitting, consider what it would be like when you’re swimming in a flat position when you’re snorkeling. It may be do-able but you may find yourself annoyed by the extra floating of your swim wear or the drag that’s produced by your wet clothes. It would be best to try to wear swim clothes that are form-fitting to avoid these feelings. Of course, if you see no problem, then there’s no problem at all! The biggest reason people will wear more than their normal swimwear is to provide more sun protection for their shoulders, back, and the rest of the upper body. Remember, the sun is likely stronger at your snorkeling destination than what you’re used to back home, especially if you’re traveling in winter. So it’s possible that you’ll burn more quickly even if you do put on sunscreen. The best coverage for your upper body that you can get are shirts with UV protection like these. The level of sun protection will vary by shirts, but many give you protection of UPF 50. You can get these shirts as a short-sleeve shirt and a long-sleeve shirt. This means you won’t have to worry about constantly reapplying sunscreen to the most exposed parts of your body. That said, don’t neglect the parts of your skin that are still exposed! So to get that UV protection through your swim clothes, have a look at these shirts for women and these shirts for men. You can find these types of shirts for kids snorkeling too, for girls and boys. Once again, consider your body position when you’re snorkeling. The back of your legs are probably more exposed to sun than other water activities. For women, if you’re looking for a bit more coverage from the sun than regular swimsuit or bikini bottoms, you may want to go for some swimming shorts like these. If you wear a swimming skirt like one of these when you’re snorkeling along in a flat position, you just may find it annoying to have the skirt flare up constantly. Although this can also depend on the type of skirt you’re wearing. But again, if you don’t mind that, then no problem! If you do wear any sort of shorts when you’re swimming for men or women, it’s important that you get shorts that are the right size, are made of material similar to spandex, or that you can adjust the waist by tying the strings. This can help so that your shorts won’t come off when snorkeling! For example, some normal gym shorts or running shorts could slide off of you as you are swimming forward because the elastic isn’t meant to hold up the weight of water. Or, if you’re on a snorkeling boat tour, when you go to climb the ladder to get back on the boat, the weight of the water could bring down your shorts. Propelling yourself forward or upward when wet is different from your shorts being in a neutral position when dry on land. So make sure you wear your shorts for snorkeling accordingly! Most of these types of shorts have this sort of safety net in place, so they can be a good choice for snorkeling. Have a look here for women’s shorts and here for men’s shorts. Once again, you can also find these types of shorts for kids who are snorkeling, for girls and boys. If the snorkeling that you’ll be doing is jumping off of a boat, you probably don’t need to think much about shoes. Then you may consider packing along this type of beach shoes. They can be helpful to protect your feet in the case that you step on any sharp objects like rocks and seashells. If you do decide to buy these kinds of shoes for when you’ll be walking across lots of sand, consider how porous the sandals are. If you’re going on an organized cruise excursion like snorkeling with stingrays in Grand Cayman, you very likely won’t need to think about bringing your own mask and snorkel if you don’t want to. No matter where you’re going on an organized snorkeling tour, whether it’s Hawaii, the Florida Keys, during a Caribbean cruise, or some other amazing top tropical destination, you can expect that this part of snorkeling gear will be provided. Still, if you want practice snorkeling before your trip because you are snorkeling without being confident in your swimming skills, you may want to bring your own snorkeling gear that you’re comfortable with. Bringing your own also has its benefits since it means that you’re the only one who has used the mouthpiece and breathing tube, since when you use tour-provided snorkeling gear, they get used by different people on every tour. And, if you’re looking at not going on an official snorkeling tour, and instead doing a little snorkeling on your own at a beach at places like Grand Turk or Oahu, you know you definitely need to think about getting snorkeling gear. That might mean bringing it from home, or that might mean renting snorkeling gear when you get to your destination if it’s available. Standard snorkel set like this one, with a mask and the snorkel that lets you breathe. This is the snorkel gear that you typically think of when you go snorkeling. Another option is to go with a full-face snorkeling mask like this one. These can sometimes be easier to get used to when you’re a beginner to snorkeling. To go with your mask and snorkel, you may also consider bringing along fins like these. But, fins aren’t exactly the most convenient travel items because they can take up a lot of space in your suitcase. That’s why if you do find a snorkeling rental location where you’re going, you can often find it possible to rent just the fins. 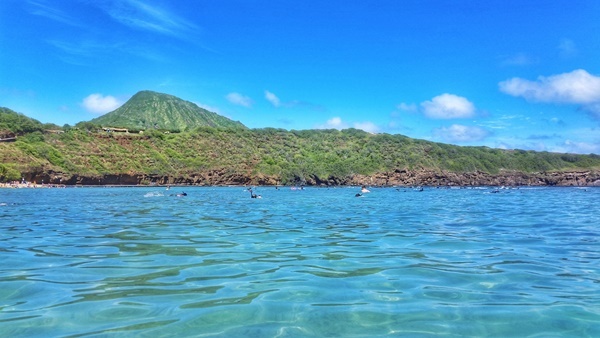 Again, for snorkeling in Hawaii, you can take a look at Hanauma Bay and Shark’s Cove for an idea of snorkel rental prices, including just the fins. Fins make it possible to swim further more easily with less energy, which means you can get more out of your snorkeling activity without feeling as tired! For this reason, whether it’s bringing fins from home, renting them, or during a snorkeling tour, consider using them! If you don’t want to spend the big bucks on a waterproof phone case for your phone, a case like this can become a more affordable option. It’s designed so that you wear it around your neck… but you still may want to hold your phone in your hand, because it does seem a little scary to trust a thin string with your phone that costs hundreds of dollars in the vast open water! If you’re going on a snorkeling tour, this may not be much of a concern, since you can expect your valuables to be safe on the boat. But if you’re headed to the beach on your own and everyone in the family wants to be in the water together, have a look at a pouch like this. It’s a waterproof pouch that you wear around your waist with all of your valuables inside of it. You can call it a sort of waterproof fanny pack for snorkeling. If not everyone in the family is going to be snorkeling, whoever stays back on the beach will probably like the idea of being able to spot you quickly out in the water from the beach. That is when a personal buoy like this or a snorkel vest like this can be helpful. Getting a bright colored one makes it easier to spot you among a ton of people out there. 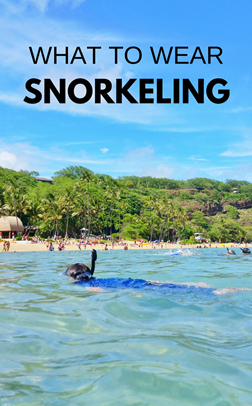 The snorkel vest can also be an added layer of security if you are snorkeling without complete confidence in your swimming skills… or even if you do have complete confidence!